Fort Bayard was established by General Carleton’s California Volunteers at the base of the Santa Rita Mountains in southwestern New Mexico in 1866. That same year saw the beginnings of the great cattle drives northward from Texas to the railroads in Kansas and many of those cattle came from New Mexico’s grazing lands. The fort’s mission was to protect those lands as well as the Pinos Altos Mining District from Apache attacks. The fort was named after General George D. Bayard, who died after being wounded at the Battle of Fredericksburg in the Civil War. Fort Bayard was initially home to Indian Scouts and “Buffalo Soldiers,” including William Cathay (a.k.a. Cathay Williams), who was the only known female Buffalo Soldier. Military leaders such as General George Crook and “Black Jack” Pershing also spent time at Fort Bayard. The fort suffered its first Apache attack when it was only a year old, and was a key post in the Apache Wars (1861-86), particularly the 1879-80 campaign against Victorio. However, after Geronimo’s surrender in 1886, the post’s importance declined and the post was deactivated as a troop garrison in 1900. 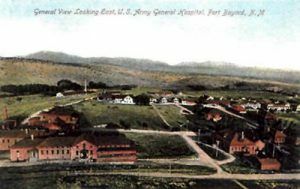 However, Army Surgeon General George M. Sternberg, noting the good health enjoyed by Fort Bayard troops, successfully worked to maintain the post as an Army hospital – primarily for tuberculosis patients.. In 1922 the fort was transferred to the Veteran’s Administration, who then utilized the site as a Veterans Administration hospital, obliterating the old fort through expansion and rebuilding. Modern hospital buildings flanked the former parade ground and houses were rebuilt along what was officer’s row, and designated doctor’s row, were built on the foundations of the officers’ quarters. The only major vestige of the old post was the cemetery, on a hill overlooking the site, with graves dating back to the early the fort’s early establishment. The fort was partially reactivated as a military installation during World War II when a number of German prisoners of war were held at the fort from 1943 to 1945. The Veteran’s Administration continued to utilize the site until 1965. 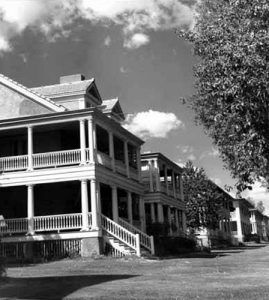 The following year, they transferred all but the cemetery to the State of New Mexico who utilized the site as a state hospital and long term nursing care facility. Fort Bayard Cemetery became part of the National Cemetery system and was placed on the National Register of Historic Places on July 7, 2002. The hospital continues to be utilized by the State of New Mexico but many of the old buildings are falling into disrepair. The site is located in Grant County, New Mexico.